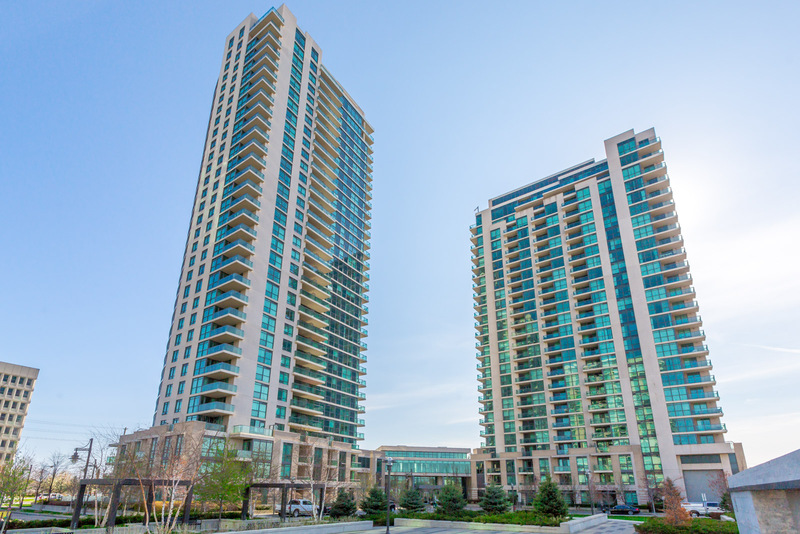 Suite 1702 at 235 Sherway Gardens Road is a spacious 1 Bedroom plus Den suite in prestigious One Sherway Condominiums Tower 1. At 662 square feet it is one of the larger floorplans at in the buildings. The open concept living and dining rooms enjoy light coloured hardwood floors with a walk-out to a balcony with views of the courtyard fountain as well as the lake. Prepare meals in your kitchen complete with stainless steel appliances and breakfast bar. The Master bedroom features a walk-in closet which is very rare for 1 bedroom units. The den is also great as it is a separate room that can be possibly used as an office, nursery, or even small second bedroom Unit 1703 is perfect for that buyer who is looking for a bit more space offered by your typical 1+1. • 1-Bedroom plus Den, 1-Bathroom East-facing suite. Includes a parking spot. • Kitchen with breakfast bar and stainless steel appliances. • Master Bedroom with broadloom and rare walk-in closet. • Den with hardwood floors and perfect as office, nursery, storage, and more! • This is one of the largest 1+1 suites at Sherway! It’s a must-see!